NSF, CAPA news could mean more aftermarket parts abroad — but possibly more oversight than in U.S.
Aftermarket parts certification groups CAPA and NSF recently announced progress in two key international markets — China and South Korea. 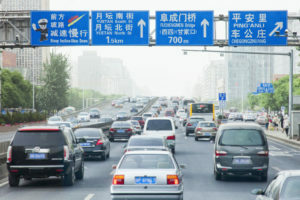 NSF in late May said that components certified by the organization had been OK’d as able to meet the Korean Automobile Parts Association’s standards, and NSF-tested items would be acceptable for substitution in South Korea. It joins CAPA, which received that blessing in 2014. 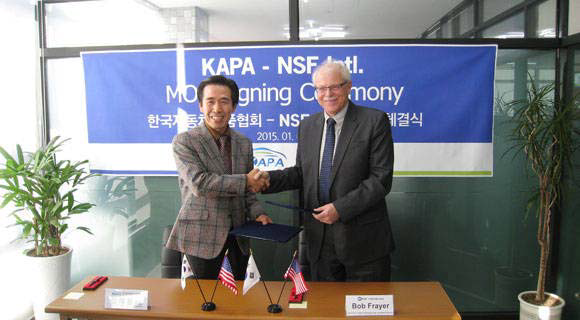 “We expect that as we develop this well-structured certification program, high-quality aftermarket parts can be distributed though this MOU with NSF International,” KAPA Chairman Seok-Won Kim said in a statement. And CAPA announced this month a memorandum of understanding with the China Automotive Technology and Research Center to help develop standards for aftermarket parts in that nation. Interestingly, unlike in the United States, the two nations’ recent approval of aftermarket parts carry a level of government oversight, though of course with China nobody quite knows what that means. The public-private CATARC administers auto standards and regulations for the Chinese government. It also runs the C-NCAP safety program, which Automotive World reported in November 2015 has made “immense progress” in closing the safety gap seen in developing countries, a sentiment echoed by TRW. In Korea, parts must meet the Korean Automobile Parts Association‘s standards, which we couldn’t find. However, the government-affiliated Korea Automobile Testing and Research Institute, which tests for the KNCAP safety standards, will also keep an eye on aftermarket parts. Also unlike in the United States, only certified aftermarket parts may be used in China. CAPA reported that no aftermarket parts were allowed at all in China for insurer repairs until Jan. 1, 2015. “So far in Korea, OEM parts have been dominating the repair parts market, and imported cars have been criticized for charging car owners too much to replace parts,” Korea’s MOLIT wrote in heralding the first certified part approved under the new system: a fender for a BMW 5-Series. Korea and China might discover before the U.S. flaws in the hypothesis such parts are irrelevant for safety — a hot debate in American collision repair — is flawed depending on how closely the two government-affiliated entities observe the part. In any case, it appears that at least on paper, Korea and China are taking a harder line on aftermarket collision parts than the U.S., which at a governmental level doesn’t formally monitor such parts — or even always require certified ones on insurance repairs.